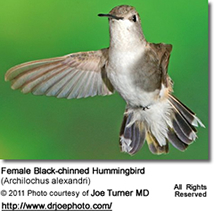 The following hummingbird species are known to occur in Missouri (with photos and ID assistance). Migrating males are usually the first to arrive and the first to depart. The females and the young usually follow about two weeks later. 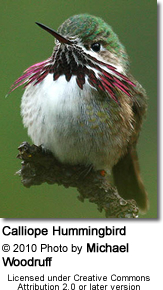 One of the larger and the most vocal hummingbirds in the United States, where it is the only species to produce a song; specifically the males produce a complex series of scratchy noises, sounding like a sharp "chee-chee-chee; when moving from flower to flower, they emit toneless "chip" vocalizations. All other hummingbirds in the United States are mostly silent. They are well known for their territorial behavior; the male makes elaborate dive displays at other birds and sometimes even at people. At the bottom of their dives, they produce high-pitched loud popping sounds with their tail feathers. Males have glossy dark rose-red throats and crowns, which may appear black or dark purple in low light. The underside is mostly greyish; and the back metallic green. 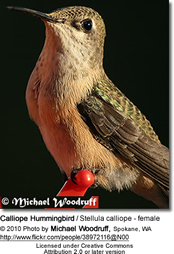 Females have light grey chests with white and red spotting on the throat, greenish back and white tipped tails. 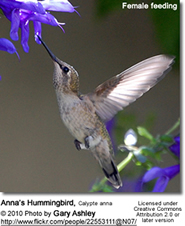 They resemble the Costa's Hummingbirds, but the male's Costa's Hummingbird's gorget (throat feathers) is longer than that of the Anna's. 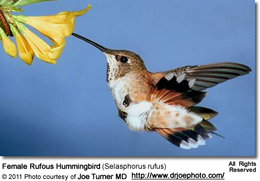 They are larger than the Rufous Hummingbirds and lack the rusty coloration of the Rufous Hummingbirds. Allen's Hummingbirds, Selasphorus sasin - Accidental Vagrants - First record of an immature male banded in Fenton, MO on November 27, 2008. Historically, these birds nested in coastal California and wintered in Mexico; but more and more of them are remaining in California year-round or are traveling to the eastern United States for the winter. 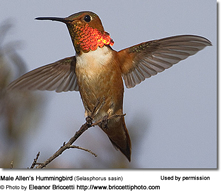 The Allen's Hummingbird is often confused with the Rufous Hummingbird, but the Allen's can be identified by the green back whereas the Rufous Hummingbird has a coppery back. The male has a throat that ranges in color from orange-red to yellow-orange, a back that is bright green, a rump that is rufous and its tail feathers are rufous tipped in black. The male has a black, shimmering throat with a purple edge and pale feathers below that create a collar. However, unless the light is just right, the head looks all black. His back is green and there are some green feathers covering the chest. The smallest breeding bird in North America. 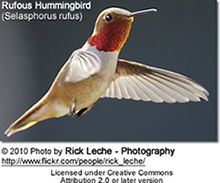 They are most easily confused with the Rufous Hummingbirds and the Broad-tailed Hummingbird. Rufous Hummingbirds (Selasphorus rufus) - Accidental Visitors ... Presence confirmed in 2015 by capture and examination of the band by a professional hummingbird bander. The same Rufous spent the previous year's Winter (Nov - Jan, 2014) at the same southeastern Missouri location (photos available). 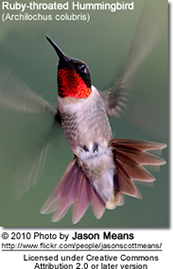 These hummingbirds are usually found in gardens and at feeders. These birds are fearless, and are known for chasing away other hummingbirds and even larger birds, or rodents away from their favorite nectar feeders and flowers. 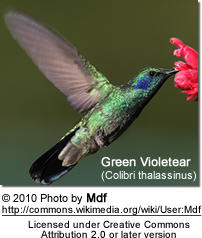 Green Violetear Hummingbirds (Colibri thalassinus) - Rare / Accidental - They are mostly resident in Mexico and Central America, but some seasonal movements have been observed. They may wander north to the United States and even as far north as Canada. 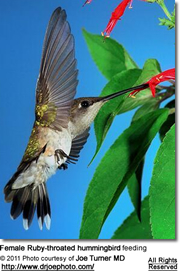 Attract Hummingbirds to YOUR Garden! !